Tashgurkan: China's Most Beautiful City? Civilization’s last bastion on the drive west towards the Sino-Pakistani border is the unassuming town of Tashkurgan. It’s perhaps surprising to find one of China’s most beautiful cities here, but maybe not. The all consuming machine of consumerism and China’s drive has yet to reach this far west. It can’t last forever. 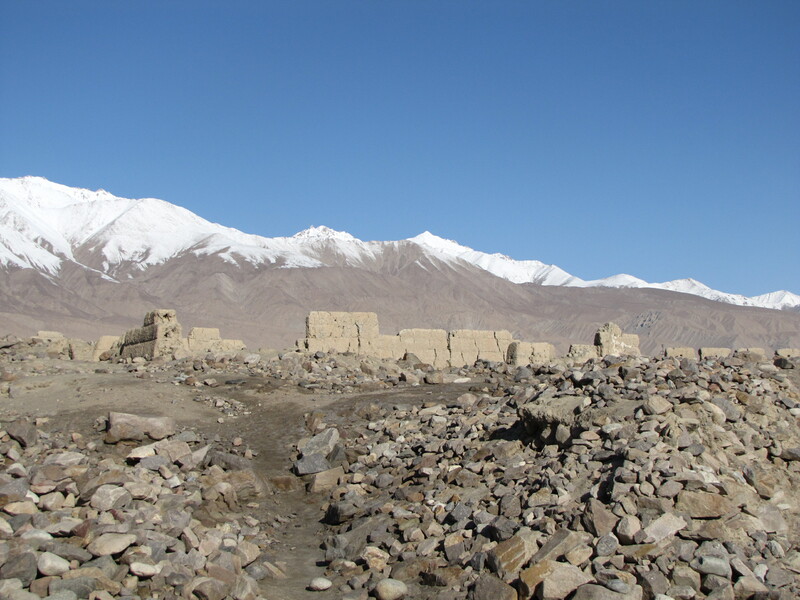 Once the seat of a fledgling Tajikistan empire – it’s name literally means ‘stone fort’, and the eponymous fort still looms large over the entire town. But more on that later. 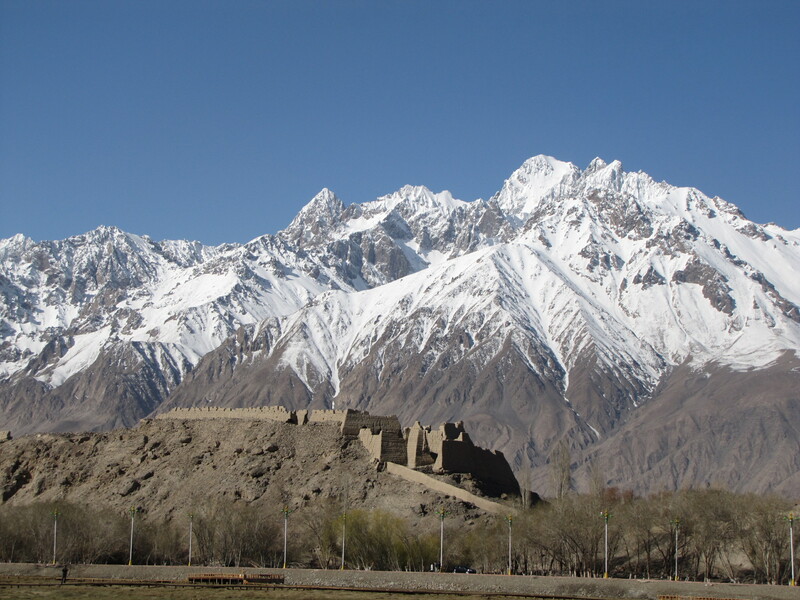 It is the final stop on our journey along the Karakorum Highway before the two hour drive out to Khunjerab Pass, where China ends and Pakistan begins. 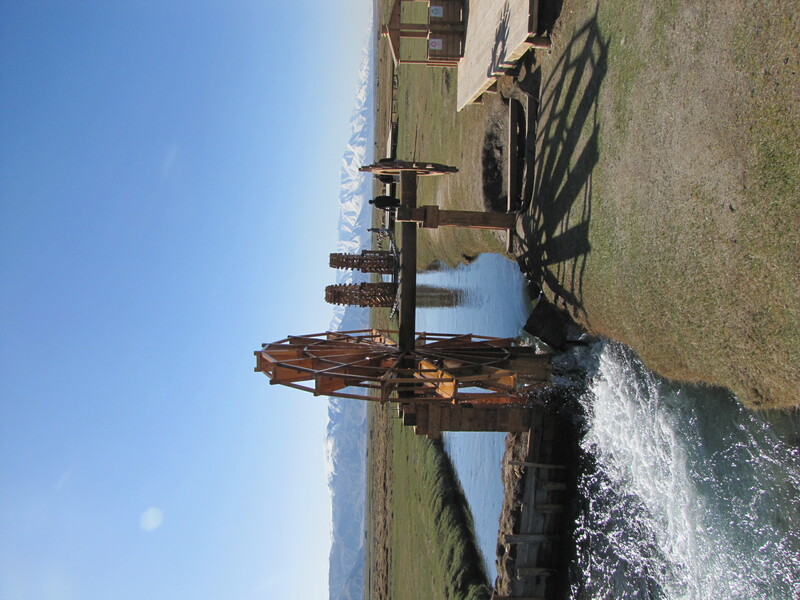 It is China’s most westward settlement and it isn’t always accessible to tourists. A checkpoint some two hours back down the road to Kashgar checks passports and permits and has the right to deny access to the quaint border town. 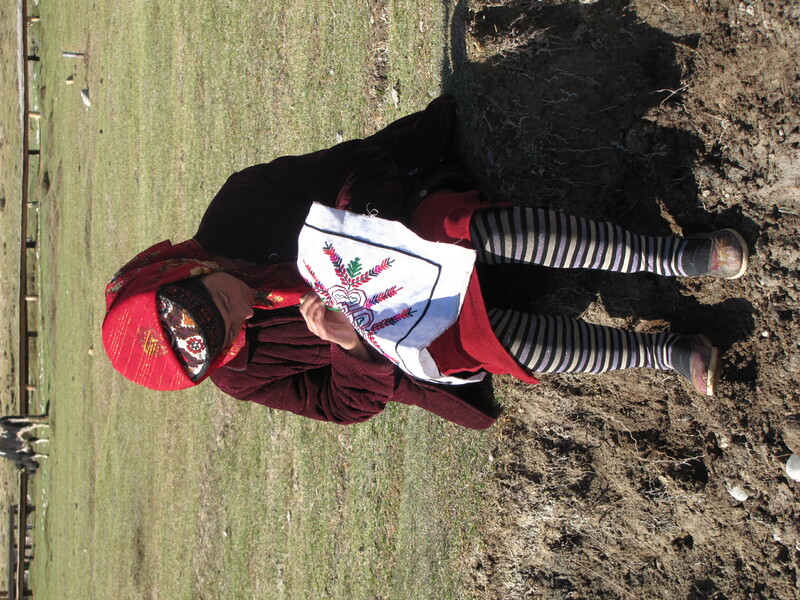 I hadn’t expected much when I noted Tashkurgan on our two day itinerary, but it came to be the absolute highlight of my week in Xinjiang. Indeed, thus far it’s been the highlight of my near three month stay in China. It may just be China’s most beautiful city. Why? Let me show you. 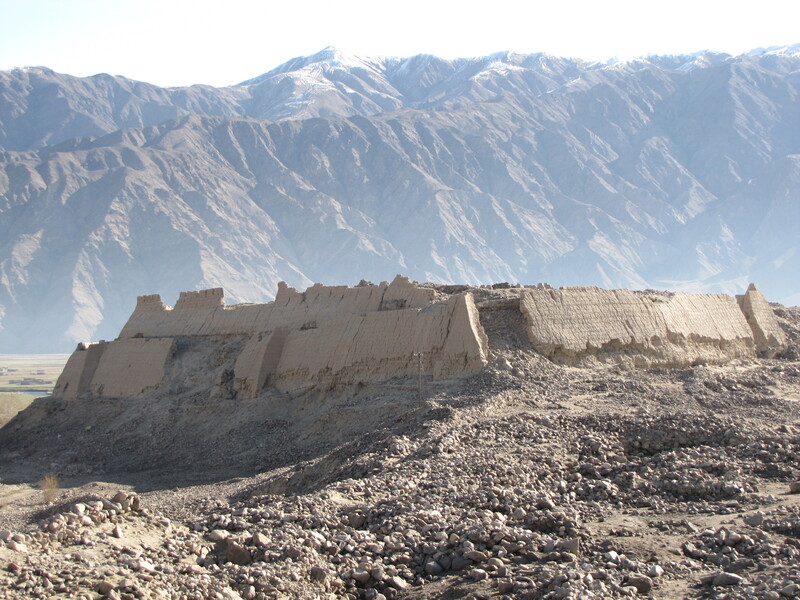 Tashkurgan’s imaginatively named ‘Stone Fort’ was another unfortunate casualty of the Chinese Cultural Revolution, but you can still soak in its 2,000+ year history as you pick through the crumbled remains of what must have once been quite an impressive fortress. Built as the seat of a long dead empire, little remains now save a few crumbling walls and a few deep holes that were once wells used to bring water from the neighboring grasslands. It’s a crisp and clear morning as Kara, Kasim, and I ascend an unassuming set of stairs and emerge atop the plateau that holds the fort. 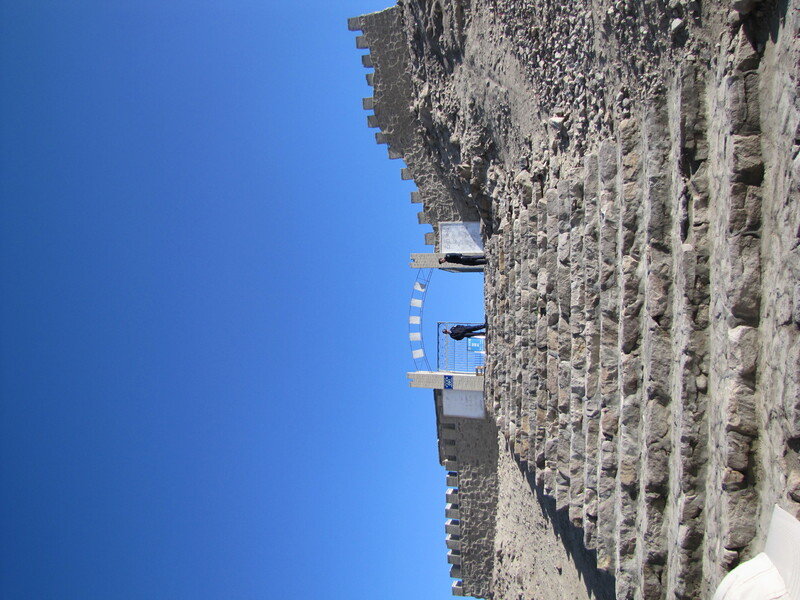 It costs 20 RMB to access the ruins and a pair of tired looking guards usher us through as soon as they’ve got our money. The stairs to the Stone Fort. Ominous? At first it’s little more than a rock strewn stretch of land, but soon the fort comes into view. 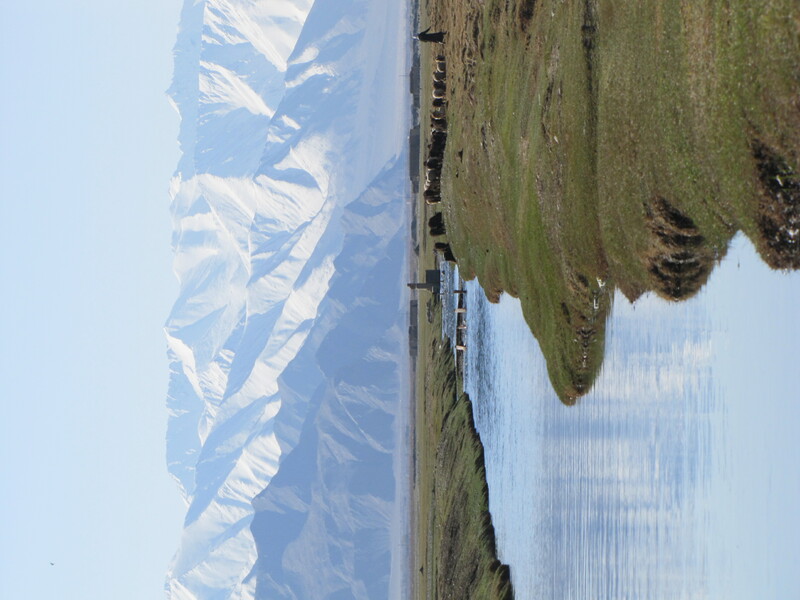 It looms out over the picturesque grasslands but pales in comparison to the majestic peaks that crown the entire region. The beauty of the place is layered and the cool morning air is bracing. I’m still feeling tender from my food poisoning – indeed, the worst is to come – but I’m able to enjoy the experience. Kasim tells us stories from the town’s past as we explore. He tells of improbable virgin births and political marriages as Kara and I happily snap photo after photo of both the fort and the view our lofty porch affords us. Sprawling out beneath the watchful eye of the Stone Fort is a picturesque stretch of verdant grassland that has been dubbed ‘The Golden Grasslands’. 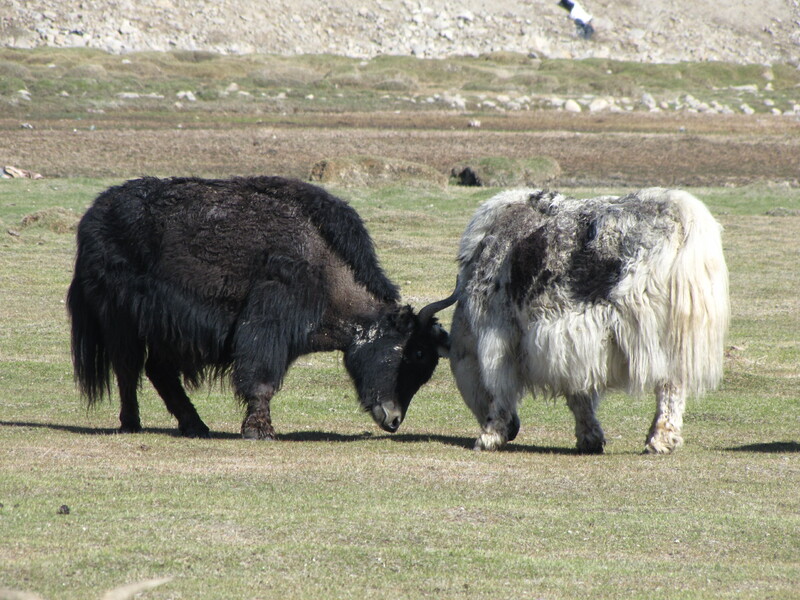 Up until the past few years it was a lush grazing land for cattle, yaks, and goats. But more recently it has been annexed by the Chinese government to turn into a tourist attraction. 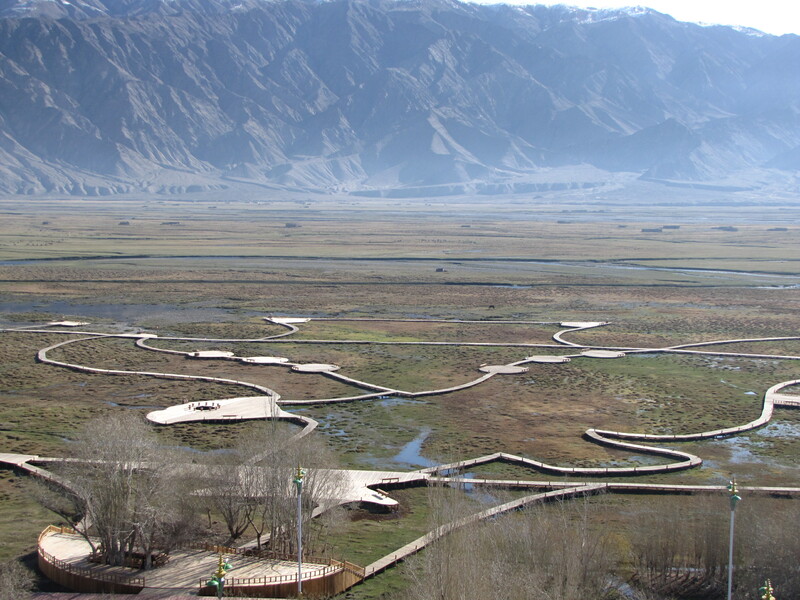 While the new look walkways make the grasslands more accessible and provide some beautiful photo opportunities, I couldn’t help but feel saddened that the nomadic people had their lifestyle completely over-turned simply so the Chinese government could make a little more money. But lucky us – the walkways have only just been finished and they had yet to start charging. Free exploration for us! 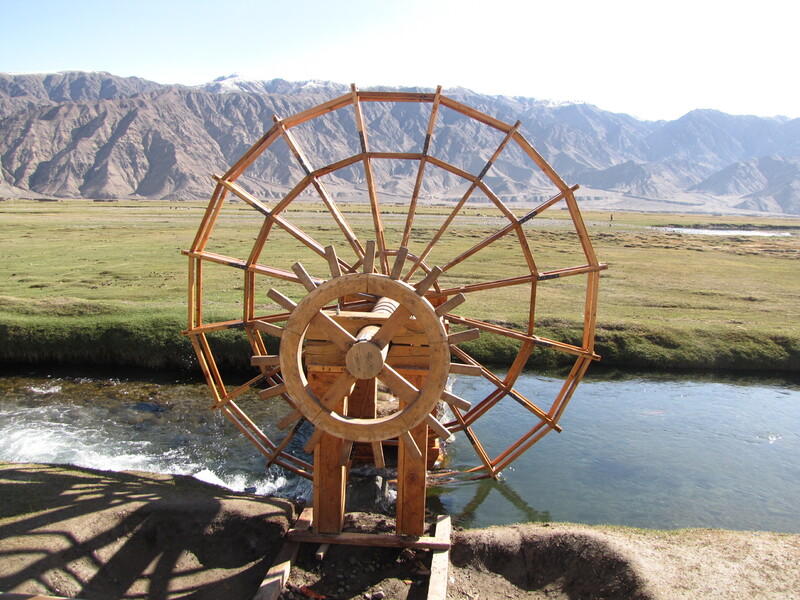 A water wheel strictly for show. But still pretty. 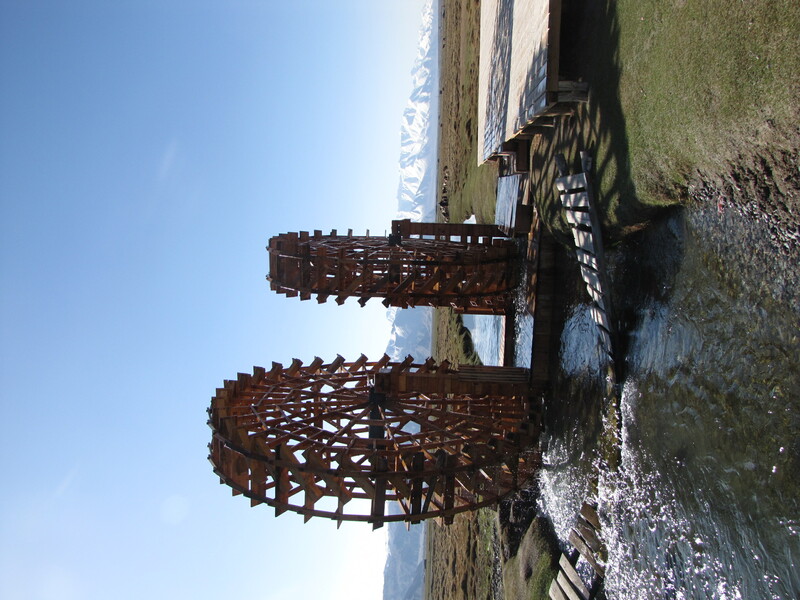 Can you tell I like water wheels? 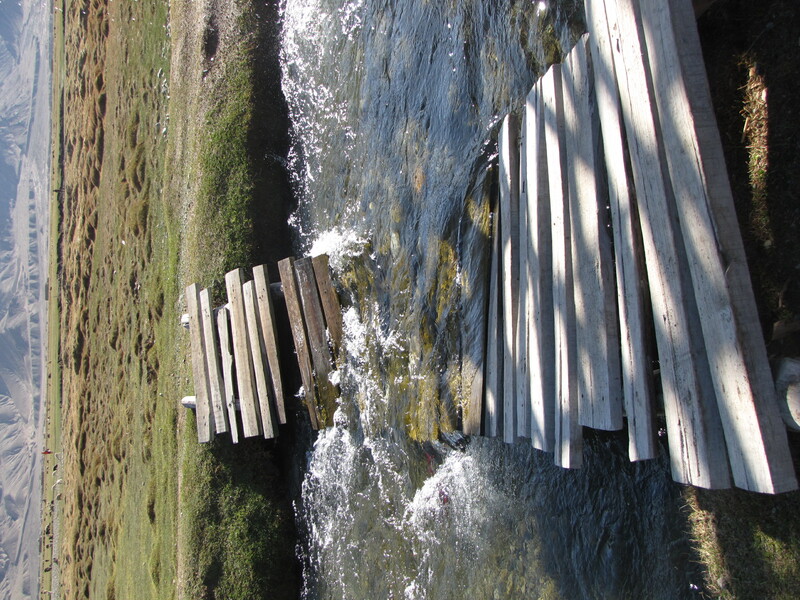 A frustratingly broken footbridge denies us access to the other side. We totes jumped. Walking around the grasslands on a sunny day was a wonderfully relaxing experience. The bleating of goats and the joyful rill of water bubbling along the stream was immensely soothing. A few locals were out in the sun as well – sowing or tending to the herd. But mostly, we shared the grasslands with other tourists. The walkway network also sports a large performance space and stage where concerts will take place. While local ambitions don’t stretch much beyond local dance and music, I’d kill to see a Coldplay or John Mayer concert in such a stunning location. The grasslands spread out on all sides and the mountains watching on from the distance. It would be something else entirely. I’m not really qualified to judge this objectively. After all, I’ve been to no more than five or six cities in a country that boasts a number that might contest that they are rightful holders to being China’s most beautiful city. 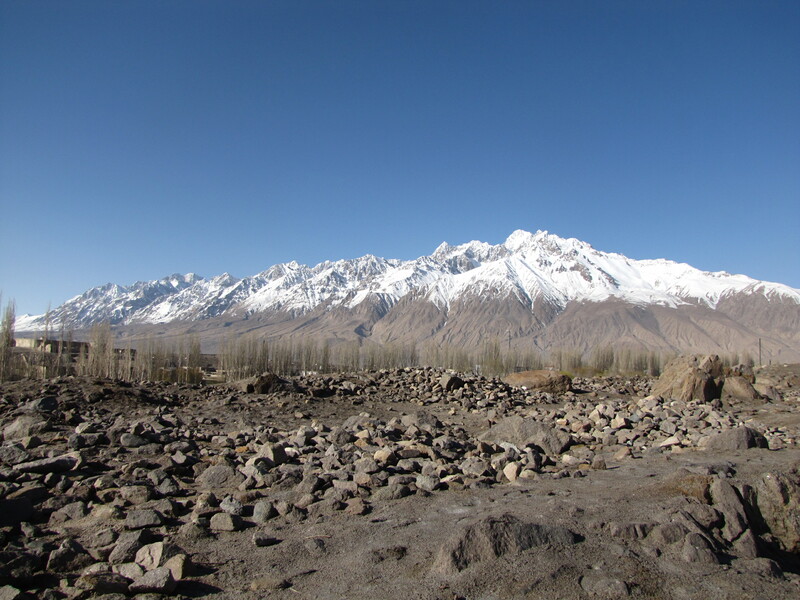 But in my eyes, it would be hard to unseat beautiful Tashkurgan. With its stunning grasslands and the ever present vista of snow capped peaks, it’s breath-taking from all sides. Its history, its friendly people, and its isolation reminded me of my own home in a way. Sure, Ben Lomond in Australia isn’t steeped in history, nor is it comparable in its beauty – but there’s an allure to me in these isolated mountain towns. 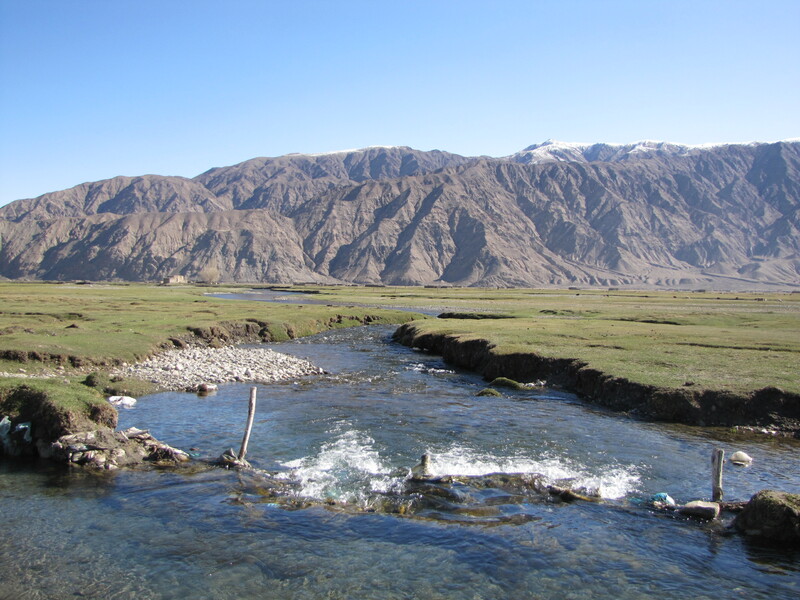 I could see myself living in a place like Tashkurgan except for one thing. Whether altitude sickness or dodgy lamb, it started in this sleepy little town. And I’m not sure I’m quite ready to forgive just yet.